Lady Pirate Nastasha Gravelle races toward the hoop with the ball. Jedi Christy led the Mission Bulldog with 18 points in a 65-52 home loss to Loyola on Tuesday, Jan. 29. The Bulldogs led at the half 26-23 but were out scored by the Rams 42-26 in the second half. 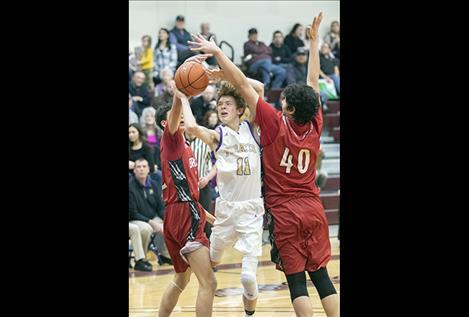 On Tuesday, Jan. 29, in a Northwestern A boys basketball matchup, the Ronan Chiefs were defeated on the road 59-34 by the Whitefish Bulldogs. On Thursday, the visiting Bigfork Vikings outscored the Chiefs 69-35. Jacob Gatch led the Chiefs with 13 points. Dallas Durheim who scored 10 points. On Jan. 29, Ryker Wenderoth led the Pirates in a 57-45 home win against the Columbia Falls Wildcats with 12 points. Micah Askan and Robin Erickson recorded 10 points each. Askan paced the Pirates with 10 points on Friday evening as the visiting Hamilton Broncs tripped up the Pirates 65-47. 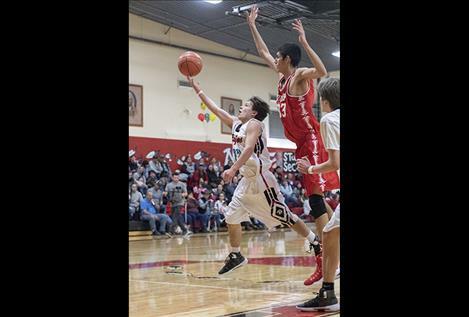 In Northwestern Class A action on Saturday night, the visiting Browning Indians defeated the Pirates 66-35, and Askan booked a team-high nine points for the Pirates. On Tuesday, Jan. 29, the Mission Lady Bulldog fell on the road 67-44 in Missoula against Loyola. Addison Arlint netted a team-high 15 points for the Lady Bulldogs. Jaylea Lunceford scored a game-high 16 points to pace the Ronan Maidens at home on Tuesday, Jan. 29. The Maidens defeated the visiting Whitefish Lady Bulldogs 43-38. 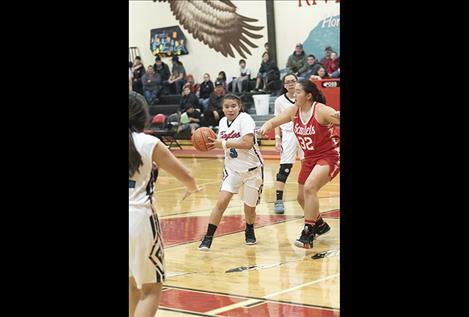 The Bigfork Valkyries slipped past the Maidens 56-54 on Thursday evening. Lunceford scored a team-high 13 points, and Regan Clairmont scored 12 points. The Columbia Falls Wildkats defeated the visiting Polson Lady Pirates 61-18 on Tuesday, Jan. 29. Lady Pirate Misty Tenas scored team-high four points on the road in a 42-13 loss to the Hamilton Lady Broncs on Friday. 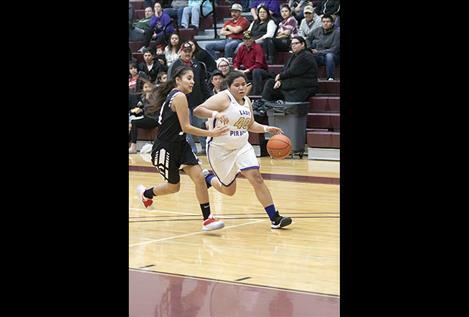 On Saturday, the visiting Browning Indians ran past the Lady Pirates 78-36 in a Northwestern A class girls matchup. Karly Lawson led Polson with 12 points.